'DC Eats and Food: My Lunches with Jeanne' series morphed into ' DC Eats and Food: My Favorite Dining Out Spots.' I don't really do sponsored or unsponsored restaurant reviews in this space. I do however from time to time feel compelled to share my favorites and dining out thoughts. I will visit a place at least twice. More often than not when I go the second time around, as in the case of one taco joint and another higher end place, I am not as excited as the first time around (insert a sound byte). In The Red Hen's case, I remembered the dishes to be excellent. When I went back this past weekend, I was surprised that they were even better than my recollection. After going out, Friday night, to a high end restaurant (I mean what's with the crazy expensive?!) with friends from out of town, we were happy to head out on Saturday night with them to The Red Hen. We bundled them (total of 8 of us) into our soccer mom minivan. It felt like old times, only with grown ups and not smelly teenage boys with muddy soccer cleats. When one of the friends asked, "so what do you like about The Red Hen? ", I was ambiguous and cautious with my answer, trying not to set up high expectations with this NYC bunch. After all, this foodie group has been there, done that, seen it all. 'It's more of our, Jonathan and my, speed.' I responded. My answer could have been misconstrued since the night before I was a tad wild. Saffron Fettuccine: top right. Salt Cod Brandade: bottom right. When we entered the restaurant the noise level was shattering, a million decibels high, which made my heart sink. Later when I expressed my emotion, one of the significant others said, and I am paraphrasing 'we end up creating our own acoustic sound.' It's true. Moments later, we were an island onto its own and the dining room noises faded away into the background. The first time we dined at The Red Hen, in the historic Bloomingdale neighborhood, we were with another couple, we were seated in a private booth by the window overlooking the open kitchen. It was quieter, the sound of other diners muffled. It was more isolated than the open dining room experience. It felt as if we were sitting at the chef's table. Still, both times were great cause' the food and company were excellent. Off the bat, The Red Hen does pastas extremely well! I guess it lives up to its self proclaimed 'Italian-influenced American restaurant' claim. 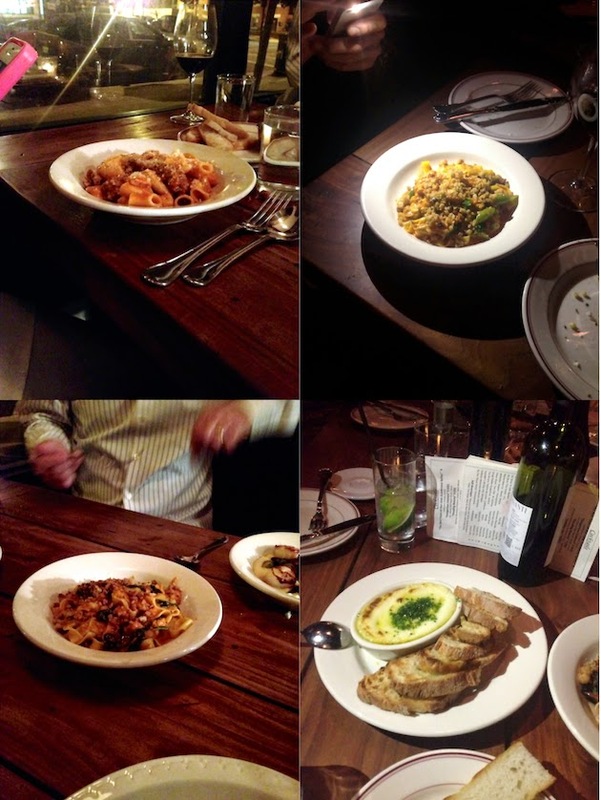 I believe we tasted every pasta dish on both the winter and spring menus. All were complex, layered, yet straight forward and most importantly packed with flavor. Just brilliant how controlled and composed the pastas are without overdoing or underwhelming the dishes. 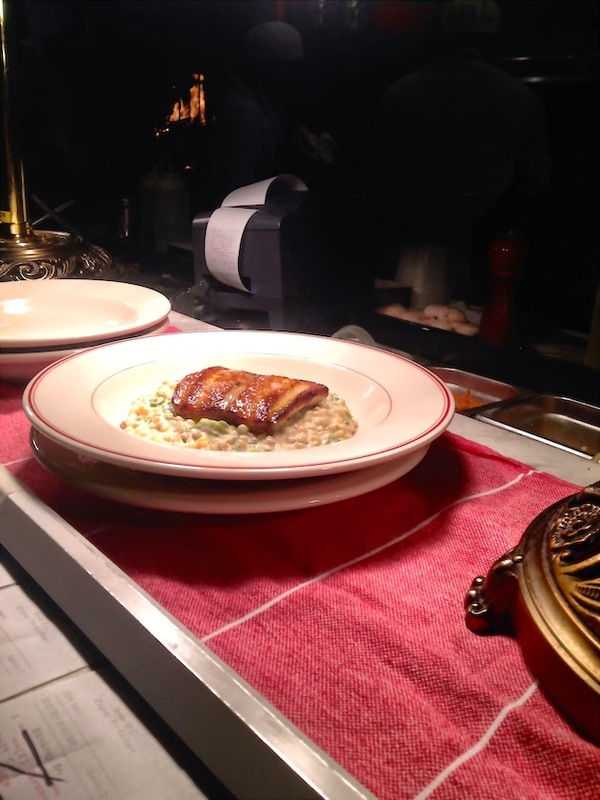 The pasta dishes showcase a very talented chef, Michael Friedman, and kitchen staff. This time, I ordered to share with Jonathan the 'Saffron Fettuccine with Rabbit Sugo, Cinnamon, Grilled Snap Peas and Mustard Breadcrumbs'. It was soul sating, in the most primal way. Carb heaven. 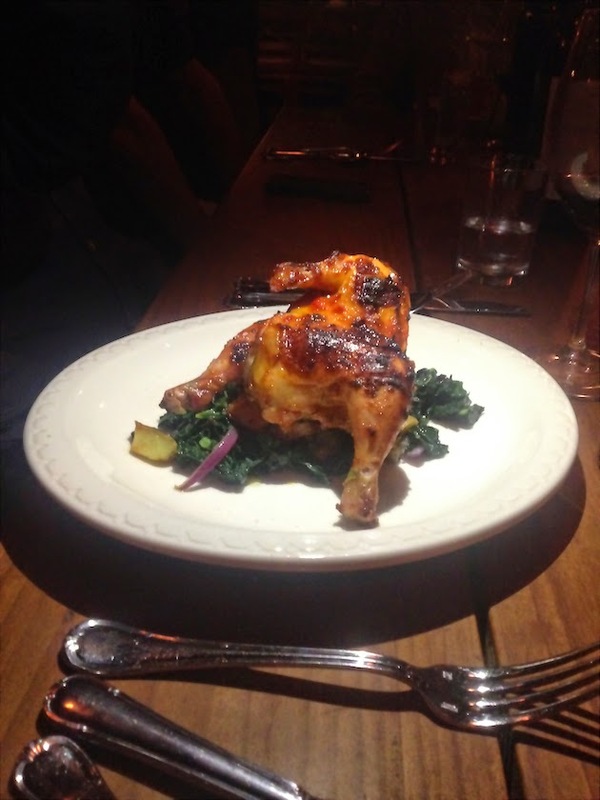 Jonathan ordered to share with me, even though we sat at opposite ends of the table, the famed 'Wood-Grilled Chicken 'Fra Diavolo' with Kale, Roasted Potatoes, Currants and Preserved Lemons'. We ordered it last time, but this time, if that is at all possible, it was even better. Jonathan is convinced the wood-grilled chicken was slightly different, though I vividly remember the bed of kale from our previous visit. Our friend, who rarely orders chicken when dining out, had the same wood-fired on my recommendation, and to say the least, was not disappointed. We pretty much ordered a myriad of dishes, if not everything on the menu, individually and to share at the table. I was really taken by the 'Salt Cod Brandade with Chives and Garlic Toast'. Although different, it reminded me of a whipped version of white fish salad, which I adore. It also brought back memories of a mezze, typical to The Balkans, served in fish restaurants in Israel, called, Ikra (EEkra). Fish eggs (caviar) in mayonnaise and red onion. Some might say other places make brandade better but I don't have a point of reference. I was good, as in happy, with The Red Hen's version and my dual flashbacks. Sometimes, it's all about the associations, I guess. Speaking of heaven, the 'Maple Custard with Toasted Hazelnut Crumble' is exquisitely sophisticated and is not to be missed. The subtleties of the custard that is sweetened just so, is just mind blowing. The sorbets are superb. The lemon, tangy, as I like it, without that lingering aftertaste as many sorbets go. We had a couple different sorbets on both visits as well as the maple custard. It's nice to see the kitchen delivers through the finale and doesn't run out of steam mid-way through the menu. Although I began to giggle even before I had any drinks in me, who would have thought I would be partial to 'Dangeous Liaisons' - a Gin, Aperol, Bell Pepper shrub, Lemon. Mind you, I don't understand any of this, Gin? Aperol, Shrub? It's all foreign language to me. You might as well speak in tongues. At bell pepper, we interrogated our poor waiter: 'is it green pepper, or red or yellow bell pepper?' Only when we found out that it's either red or yellow, I ordered it. Then we discussed shrubs, and I went for a second, even if based on my behavior "dangerous Liaisons' lived up to its reputation and I should have stopped at one. If you are curious, follow the #NYCeatsDC hashtag and find out all about our last weekend's food and other shenanigans. You can also follow on Instagram to see more NYCeatsDC snapshots. It was a weekend full of delicious food and mighty fun. Photos in this post were taken on my iPhone, over my two visits to The Red Hen. The menu slightly varies from season to season. My husband and I have traveled to DC often but have never been to the Red Hen, thank you for the review! The Fra Diavolo with kale, potatoes and currants oh my that would be my choice, but everything you've mentioned sounds amazing! Hi Brenda, it's a fairly new restaurant which might explain it. :) I think it's 1 year old 2 at the most if I am not mistaken. I haven't been to DC is over 10 years but we'll definitely have to try this restaurant the next time we go! Sounds great! Adding this to my must eats next time I'm in DC! This really does sound wondreful. Just my kind of spot! Next time we are in DC we will have to stop by! I should have eaten before reading your post. The next time I'm in DC, I'll put this place on the to-do list!